One day on RIPTA, each dot is a bus. We need more dots. If you watch it’s interesting that the western half of the state gets very little coverage. But then population wise, there’s hardly anyone there. Then there are the buses that go toward Narragansett, the dots just fly through but never return. Bus locations are tracked in realtime? Or is this just an idealized visualization based on bus schedules? If RIPTA does track bus locations, do they explose the data like the MBTA? One weekday (from 4:30am to 4:30am) of transit activity in Rhode Island, based on the General Transit Feed Specification (GTFS) data made available by the Rhode Island Public Transit Authority. So, I believe this is based on the projected timestamps as published in the schedules (i.e. the information RIPTA has provided to Google Transit) if I am reading that correctly and not on GPS. RIPTA is implementing GPS on all buses and expects to make that information available to developers for apps and such, but I don’t think it is completely implemented yet. Yeah! If you don’t count Westerly, URI, two out of our three state Amtrak stations, and several state parks and beaches, there’s hardly even anyone worth serving in the west half of the state! Why even bother wasting valuable resources on all that nothingness? Interesting video. I don’t know if I would say that the western part of the state is not worth serving. It’s just that many of those areas are thinly populated or where there are populated are widely dispersed from one another. Servicing the core cities around and including Providence are obvious. The East Bay has the advantage of being mostly linear with towns/cities that have concentrated population/commercial centers (Newport, Bristol, Warren, and to lesser degree Barrington). Combined Western Kent and South County may in fact have a greater population along with having some concentrated town or village centers, but the region is much larger and is decentralized and non-linear, which makes mass transit less efficient and with its greater distances tends encourage driving. See, when I can make a sarcastic, hyperbolic comment like the one I just made and have someone actually think I was being serious, that’s kind of a huge problem. I’m here agitating for that better mass transit in the lower parts of the state – Westerly especially. I’m here agitating because this state is so small that we could cover the entirety of it pretty effectively if the impetus was there – and the sparseness now means there’s room to grow. It also means that it would not take much to bring the most basic of services to the dead zones. And it certainly wouldn’t require a herculean amount of investment. Even an hourly bus service would be worlds better than what’s here now. There’s no reason you can’t run a bus between Westerly’s Amtrak station and Watch Hill, or a bus between Westerly and URI along Route 3, and the only reason you can’t run a bus between Westerly and Wakefield is because US-1 is an aborted abomination of a half-freeway that was designed impossible to cross in Charlestown. Also keep in mind that the population of South County (those beaches you mention) only has any real population for 3-4 months. URI has a smaller population for the remainder of the year. So it’s tough… and that 3-4 month population isn’t likely to take RIPTA anywhere, though here’s something I didn’t notice… is there a bus route that goes from Westerly down Rt 1 to 138 and into Newport, hitting the major beach towns, like stopping at commuter lots? Because that might be used in the summer by folks staying in South County who would like to visit Newport, but don’t want to deal with the traffic getting in. Ryan: I don’t know why you would make a hyperbolic comment instead of just saying what you mean. Also, the places you mention are not in the most sparsely populated western portions of the state, aside from Westerly, which is the southern part of the state, not the sparsely populated western area. Actually, it does take enormous resources to cover sparsely populated regions, even hourly (some areas of metro Providence don’t even have hourly service). You need rolling stock, drivers, fuel… If you live in Hope Valley or Wyoming or somewhere along 10 Rod Road, that is your choice, that does not mean we need to be wasting resources to to send buses out to phantom riders. As for Westerly to URI along Routes 3 and 138. Google says that is a 41 minute drive. Assume you’re on a bus making stops, that is easily over an hour. Anyone who lives in this region has a car and will be driving along Route 95 to make this trip which would only be a little over 30 minutes. Again, it would be great if we could have service for everyone everywhere, but it actually does cost a considerable amount of money to run buses over long distances with very few passengers. Besides, we already have Westerly to URI transit service, via Amtrak. And if you take Amtrak from Providence or URI to Westerly, once you get there there is free trolley service from downtown Westerly to Misquamicut several days a week in season. Google also says that the same trip up via I-95 is a 37 minute one, a four minute difference. I’ve never timed an actual bus stop once a bus gets moving, but they have a funny habit of speeding right past stops where nobody is getting on or off, and also not sticking around for long whenever they do stop – I imagine the entire trip, end to end, would be closer to 45 minutes than “over an hour.” The infrastructure is already in place from the awful, terrible, no good very bad #90 “Park ‘n’ Rides” bus to be reclaimed for such a route. The argument that it’s too long a bus route isn’t really valid, in my opinion, when Routes 14 and 66 are at least as long and probably longer. The free trolley service you mention sounds nice, except it doesn’t take wheelchairs. Or bicycles. Or anyone on Sunday, Monday, or Tuesday. There’s room for improvement. Plenty of room for improvement. Regarding Westerly, Alon Levy once said in a comment (I don’t remember where it was posted) that the bulk of Westerly’s population currently either works in-town or in the New London/Groton area (8,000 to 9,000 residents roughly split in-town to NL/G). His figures showed that not whole lot of people worked within South County and an even a smaller number worked north of the county (possibly it was 750). That’s not to say that there shouldn’t be some service. Besides Amtrak and a potential MBTA stop (or even Shore Line East), it might make more sense to link the town to the New London area’s SEAT transit system including Downtown Westerly’s sister village of Pawcatuck. Alternately RIPTA could experiment with a year-round internal Westerly bus route, expanding beyond the inconvenient if not ridiculous “flex route.” which could link urban north neighborhoods to downtown, the Post Road shopping centers, and the beaches. Ryan: Add the fact that this mythical bus runs at best hourly, and your 37 minute trip via car on Route 95 can become a 1 hour 41 minute wait to get where you need to go if you decide to forgo a car. If there are so many empty stops, why are we running this bus? In a perfect world we’d have buses and trains and monorails and hovercraft running all over creation all the time, unfortunately there are real life limitations to what RIPTA can provide. RIPTA would lose stupendous amounts of money on fixed route service in this area. We have rail infrastructure in place that can make these trips with connecting services via RIPTA to large population centers. Unfortunately, just as RIPTA is not allowed to cross into Massachusetts, SEAT is not allowed to cross into Rhode Island. Those are regulations and insurance issues that we have the power to change, if there is a will to work regionally and do so. His figures showed that not whole lot of people worked within South County and an even a smaller number worked north of the county (possibly it was 750). That’s not to say that there shouldn’t be some service. Besides Amtrak and a potential MBTA stop (or even Shore Line East), it might make more sense to link the town to the New London area’s SEAT transit system including Downtown Westerly’s sister village of Pawcatuck. Alternately RIPTA could experiment with a year-round internal Westerly bus route, expanding beyond the inconvenient if not ridiculous “flex route.” which could link urban north neighborhoods to downtown, the Post Road shopping centers, and the beaches. An internal Westerly bus route would be phenomenal! I don’t think that’s too much to ask for at all. We don’t know that it’d be a huge revenue loser, because it’s never been done. I think it’d be a well-patronized bus route, actually, because there are no connecting services via RIPTA in this area. Once you get off of the train in Westerly, you are on your own. If you don’t live within walking distance of Westerly Station, your only option is to drive to the station and park. Kingston is a little bit better off, in that there are connecting services to URI, Wakefield, Narragansett, Newport (of course, not a single one of these services is well-timed to synch up with train riders in either direction, but that’s neither here nor there). Even at Kingston, however, if you’re coming from anywhere west of the station – it’s driving for you. As a result, Kingston’s parking lot is perpetually full, Kingston’s overflow parking is frequently exhausted during the busiest parts of the day, and I imagine Westerly’s in a similar situation. We’re in talks now to expand the available parking at Kingston – and, something tells me that a garage is not too far in Kingston’s future. RIPTA does not have to run services everywhere to determine if they would be successful. There are many ways to determine, without actually putting buses on the road and seeing what will happen, what the demand for transit in a given area would be. If RIPTA felt they could reasonably afford to provide the services you describe, they would. Undoubtedly, we as a state and region have to do a better job providing and expanding transit services, but not everyone is going to get these services because it will never be feasible to provide them to everyone. People who choose to live in sparsely populated areas of the state cannot expect these services to be provided to them. I think the most practical way to help Westerly transit riders short-term would be to work out a deal with Amtrak so they honor RIPTA monthly passes for intra-state travel and/or discounted multi-ride tickets. The do have 5 trains from Westerly each weekday to Kingston and Providence (and beyond to Boston) and usually a lot of empty seats as they get farther away from their NY market. That map certainly suggests that Westerly is dense enough for transit. It is also my belief that by introducing transit, it in turn encourages developments that utilize that transit: should regular bus service ever come to Route 3, I would expect it to become a marketing point. That having been said, let me ask you this: when the proposals for a garage at Kingston Station come out, will you be in support of or opposition to that garage? VRE has managed to ‘figure out’ that they can collect some money on Amtrak’s empty seats in VA by offering ‘step-up’ tickets. For $5 more, your VRE pass suddenly turns into an Amtrak ticket over the equivalent distance. We should have that here, too – for Amtrak, the MBTA, and for RIPTA. This should work both ways – no matter where it is, an empty seat helps none of these companies. So, the Interzone passes you can buy today should be usable on RIPTA bus routes, RIPTA bus tickets should be valid as all or part of the fare between Providence and Wickford, an Amtrak pass should entitle you to ride the Commuter Rail to T.F. Green (and a valid ticket stub, used to connect to the next commuter rail in Providence), and for $5 more you should be able to upgrade yourself into an Amtrak seat. The system works. Virginia is proof of it. Just to beat the dead horse a little more, the 66 follows Route 2 west of URI between 138 and 102. Not that many people live in this area or if they do it’s at a low density and dispersed. There are no villages along this stretch though there are new-ish strip malls and the occasional house, roadside restaurant, or industrial building. It’s hard to find even a suburban residential plat, though there may be a trailer park. Along much of the road it’s either woods or agricultural land. It might be possible to construct intermittent small Park and Rides lots or widen the road shoulder at bus stops to allow for setback parallel parking areas, so people beyond walking distance could access the bus. An approach like this might offer a way to incrementally build ridership in remote areas. Someone else would have to confirm this, but I vaguely remember decades ago that there was a Hartford Avenue/Route 6 bus that extended into Johnston and possibly to North Scituate. The route ran fairly late into the evening, because I knew of people who were able to get to downtown events using the bus. Likely during a routine budget/service cut cycle the route was lost. A consideration for RIPTA to expand service in remote areas, even with budget constraints, might be to extend existing routes a little further and/or locate Park and Ride lots at existing route end points on the edge of more densely populated areas. Other than Westerly, which probably has enough density to justify a fixed bus route, other less dense regions that are not served by RIPTA could benefit from incremental increases in transit. Any new or expanded service would require a marketing or advertising push to let people know of its availability. Regarding Virginia and Amtrak, several questions come up 1) How was a deal struck, (MBTA and Amtrak haven’t always had the best of relationships) Did it require political pressure to get Amtrak to cooperate? and 2) Does VA subsidize any part of the ride on Amtrak trains? RIPTA / RIDOT / MBTA should contact VA officials to find out how it was achieved. This would be really worth pursuing. Well, we are having an attack of fruit-fly-like things here. So I can’t look at this without cringing. It looks as if the bugs from all over the state are converging on our flat in the Jewelry District. We should stop worrying about how people who live out in the woods have no transit options. That can not be fixed. Focus instead on what can be done so most people living in 5k/sq mi territory no longer get in the car when the milk runs out, to bring the kids to school, to work 4 miles away, to go out drinking, etc. I think the Every Bus Goes to Kennedy Plaza scheme is obsolete. The 5k/sq mi. regions needs to be covered by a network, not a hub and spoke system. Actually, that can be fixed – and it needs to be fixed because most people living in 5k/sq mi territory and driving around it are only part of the problem. The other, much larger part of the problem, is people living in significantly less dense territories driving longer distances into – or worse yet, through – cities. Something tells me that there are a great deal more cars on the street in Providence belonging to visitors from the wilds of Massachusetts and the rural parts of RI than there are Providence residences. You could also start running more transit out to farther places, and encourage utilization of that transit, and development along that transit corridor. Remember, the concept of the suburb predates the automobile: before we had car sprawl, there were streetcar suburbs. Even without the modern LRV, I think that we can have bus suburbs – we can even have them here, in South County. The beauty of the bus is that it requires almost zero new infrastructure investment, making it an excellent starting point to proliferate transit from. The hypothetical route from Westerly to URI along Routes 3 and 138 doesn’t need to stop anywhere – there’s not a whole hell of a lot to stop at along the way – but, as more and more people use the bus, development can be encouraged along those Routes, and request-stops can be added whenever a development worth stopping at is completed. The corridor becomes denser, transit utilization increases, better headways on-route are justified and we come that much closer to a sustainable community. Honestly, I’m somewhat surprised that the concept was as poorly received as it was. We agree on that much, at least. Ryan, The concept was so poorly received because the bus system in the densely populated areas is so broken already that the idea of spending money on the remote, thinly populated areas of the state makes people who want quality transit options for the majority of people cringe. We’re talking about people who CHOOSE to live in remote areas where they have to and, often, want to rely on cars. We’re talking about people who do not want to take the bus. Ever. People who move to thinly populated areas do so expecting to use the car. There wouldn’t be enough money in the entire country to fund transit options for those areas to provide frequent enough service to make it worthwhile to anyone. Yes, we had streetcar suburbs. But most of those suburbs were closer to the city and the people lived closer to the streetcar line. When those went away, people moved farther out. Streetcar suburbs existed because far fewer people owned cars. There were shops within walking distance or along the streetcar line. Now those shops are gone. People in those more remote towns can’t walk to things if they wanted to, so they own cars. People got used to the convenience of going where they wanted when they wanted. So you can put a bus there, but if too few people ride, it’s a waste of money. And I’m pretty sure you’re wrong about the number of cars on the street in Providence. They’re likely mostly from Providence, Cranston, Johnston, Warwick, Pawtucket, East Providence, Barrington, Seekonk, and the Attleboros. Those places have some population density to them. They have decent bus routes and the commuter rail. 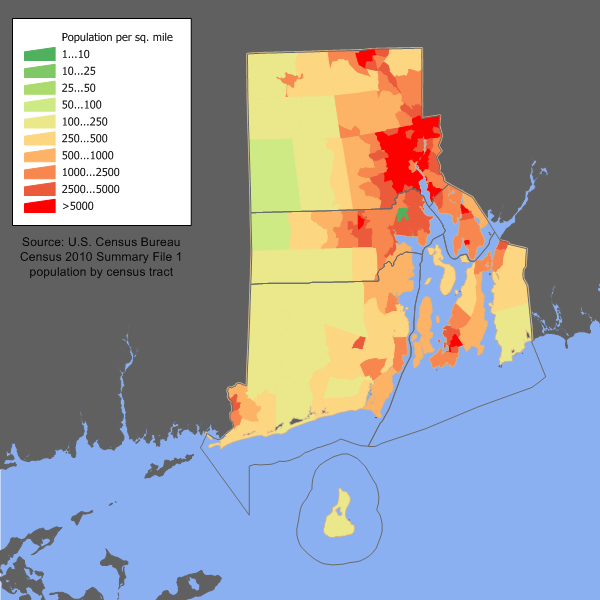 Yes, there are people from farther out in MA and RI, but I would venture to guess they make up less than 50%. What we need is commuter rail service down to Westerly/New London and up to Worcester. People can drive to the train station and take the train in. The problem is not the number of people driving in rural areas, but the number of people driving in urban areas. Let’s get people out of their cars in urban areas (I’m one of those people who lives in Providence and would use the bus more often if it was more convenient). Peter, I don’t know how they do it in CT, but when Shoreline East breaks down, riders take Amtrak into New Haven at no cost. I’ve had it happened to me taking the train from Branford to New Haven. The train was late, then they told us Amtrak would be coming and to just get on. Of course, the Amtrak train didn’t stop at the station in New Haven I wanted (because it was closer to my destination), but I wasn’t so delayed waiting for the next SLE train. Heck, I don’t even think they charged me since I had intended on paying for my SLE ticket on the train (there may not have been a place to buy a ticket at the Branford station). Remember, the concept of the suburb predates the automobile: before we had car sprawl, there were streetcar suburbs. Yeah, but the West Side of Providence or Somerville, MA are streetcar suburbs. Those places grew up around the logic of public transportation. Suburban sprawl is designed for the logic of the automobile, and public transit doesn’t always graft onto it well. When you get into the sprawl, providing meaningful public transportation options becomes more and more expensive (as with EVERYTHING in the suburbs, the true costs are hidden in subsidies and externalized costs). If you want transit, move to the city. Its a crime that city living is more expensive than the suburbs…it should be the other way around. I;ve always heard criticism of the hub/spoke system to Kennedy Plaza. Yet when I was on the RIPTA Board in the 1990s we tried several “crosstown” routes that didn’t go to KP, even one connecting several social servce agencies on the south side of Provdence. None of them worked well in drawing riders, in part because there wasn’t all that much interest in pomoting ridership at the agencies or even at CCRI-Providence. And routes that don’t go the Plaza now (e.g. #64) are among RIPTA’s weakest. I doubt that this situation has changed, but if somone has a good idea for a route or routes that don’t go to KP why not suggest it here to start with? Note with current funding, it will likely have to come at the expense of an existing route. On the other hand, a well thought out vision of additional routes might be helpful for generating support for additional funding. I wasn’t trying to troll or anything when I asked Jef earlier if he was willing to support the garage at Kingston Station when it gets built. (And it will get built.) If we do decide that keeping the driving-heavy status quo in rural areas and building garages at train stations to get them to take transit into the city instead of their cars, I am absolutely fine with that. I do drive over to Kingston and get on Amtrak whenever I want to go to Providence or Boston. The idea of driving in either city fills me with dread. My goal is to provide reasonable transit access to everyone. That goal isn’t necessarily met by more buses – although I think that the success of more buses would rely just as much on people who would gain the option to get off the train at Wickford and ride a bus down to somewhere else as it would people getting on a new bus and riding it into Wickford. What I don’t want to see happen is that the rural communities – places like Hope Valley and Coventry and North Scituate – all get choked off as an unintended consequence of fixing the problems with transit in Providence (and to a lesser extent, Woonsocket and Warwick). I would love to move into the city. Unfortunately, I’ve been priced out of living in the city. It’s sort of amazing, really, when you look at a $594 monthly pass for Amtrak and realize that’s just about half of what I could expect to pay in rent if I was living in Boston – and the lower cost of rent in Providence is evened out by the $314/$374 (MBTA and Amtrak, respectively) I would still need to pay for that monthly pass. The solution is to make the cost of urban living come down – more specifically, the cost of housing/rent itself. That means more urban housing – more residential wherever we can build it. Since the current climate seems to suggest that building anything residential other than luxury in a city is a fruitless endeavor, I propose building more residential around train stations. Wickford Junction is a blank canvas and I hope to see some condos or apartments go up there at some point. I’d happily move. The topic of affordable housing in cities would be worthy of a more in-depth post. This subject is somewhat off-topic, but it isn’t as far as how transportation effects the issue. Christopher Leinberger who has written extensively on ‘downtown’ type development, who spoke in Providence at the most recent Power of Place Summit said that the pent up demand for residential units in downtowns across the country will take 20 or 30 years to fill. Note that even during this recession the 98-99% occupancy rate and very high rents, which have taken hold over the last 5 to 7 years for Downcity rental units. No sooner does a developer complete a project, it fills up. Leinberger also came up with the phase “drive until you qualify,” meaning that the further you are from the center(s), especially when buying, the cheaper and more dispersed the housing is. This model, which started in the 50s auto suburb relies on privately owned cars and cheap gas. It’s not just western or southern Rhode Island. I know of a number of people who are on the lower end of the economic income spectrum, who formerly lived in less affluent sections of places like Pawtucket or Coventry, who now live far out in the woods in eastern Connecticut. Some of them actually commute to Providence or beyond to southeastern MA. Those ex-urban places will never have mass transit. Besides demand, the dilemma with creating affordable housing in cities revolves around land, materials, and construction costs. Dated zoning also has an effect. The situation has changed – in a big way. Forget everything “we know” or “we learned” in the 1990s – none of that has been relevant or actionable since 2008 and probably since even earlier than that. As for why RIPTA’s 64 is one of their weakest routes, the problem isn’t that it doesn’t go to Kennedy Plaza – the problem is that it is terminally underserved, doesn’t link up well with trains at Kingston at all, and its last run in the evening is too early to be of any real use. Fix the problems with 64’s schedule, and you’ll fix the problems with 64. Similarly, Route 14 could also do with some schedule overhauling to link up better with trains at T.F. Green, and Route 66 should stop all of its buses at Wickford and Kingston going forward. Someone should also lean on RIDOT for pedestrian accommodations in the vicinity of Wickford Junction – Route 2 in that area is actively hostile to pedestrians and Route 102 is not much better. Oh, and as long as we’re talking “routes with abysmal scheduling” – Route 8. It’s no wonder this route is doing as badly as it is, considering there’s only 6 inbound and 7 outbound runs on it. Going forward, it should be an hourly service – if not half-hourly. Route 29 should be extended to NEIT and East Greenwich Square. Assuming the “R-Line” is actually going to happen, it (or Route 11) should be extended to the Airport, as should Route 1 – which comes extremely close to the airport and stops short of it already. Of course, those are a bunch of route and schedule adjustments. You asked for new routes.. Well, I have a few new route suggestions. There are probably more that could be made. This is just a start. And, therein lies the crux of the problem – most of the vacancies are at the luxury end of the spectrum. If you can afford to spend $1600 ~ $2000 a month in rent, you’ll have no trouble finding a space for yourself at a place like Boston’s Harborpoint on the Bay. The lower your cap on rent, the less and less vacancies there are. This is further complicated by there being such low occupancies and high demands that landlords can raise the rent as soon as a tenant leaves – someone who was occupying a $700/month studio leaves behind a $1000/month studio for the next occupant. We need to be building a lot more housing, wherever and however we can build it. This should be a new thread: What should a RIPTA map designed from scratch look like? Right now, most people in the 5k/sq mi. areas do live a few minutes walk from a bus stop. But for most, the bus runs hourly or less to KP. Adding new ad-hoc low frequency loops, connectors and routes to the hinterlands will not change the fact that all but a few of the conceivably desired journeys within the urbanized area are nearly impossible by bus. The new system needs to be a grid with carefully located nodes, not a radial network. That way, everyone lives near a bus stop with service no less frequent than 15 minutes. If your bus does not go to KP or wherever you want to go you have a reliable, easy transfer to a fast, very frequent rapid bus or streetcar to KP as well as to several other crossing lines that also run no less than every 15 minutes. The goal is to be able to go anywhere, anytime, without waiting more than a few minutes for a bus. You will probably have to transfer, but that will never take long. You will have to go via KP only if that is the fastest or most direct way. Transfer points will be nice places with shops and activities. Let’s dream. Another nice thing about this is that there is a bus or streetcar leaving KP in your direction every few minutes, but with only a few high frequency routes instead of dozens of low frequency ones, downtown no longer requires a big bus-o-rama like KP and the hub can be at the train station. For what it’s worth, I find that when people talk about not being able to afford to live in the city, often what they really mean is that they can’t afford to live in the neighborhoods that they think are the most desirable / safest / whitest. Once you look beyond Downcity and the East Side, you’ll find a great number of vacancies that are cheaper than a suburban rent + transit pass. In terms of making more housing available, maybe a good step would be for the city (or the state? not sure how these things work) to change tax codes and regulations so that abandoned or foreclosed properties can be resold and redeveloped more easily, rapidly, or with better incentives. There’s certainly no shortage of empty residential buildings in neighborhoods like Lower South Providence, Elmwood, Smith Hill, and Olneyville, and the housing stock mostly wouldn’t create luxury-priced rentals. Apartments and condos in Downcity will probably almost all be at high prices because of their location, regardless of new developments. These may be modest places, but they are in decent city neighborhoods. I have a friend in a 3 bedroom in an owner-occupied house on Federal Hill for $990, includes 2 off street spaces in a lot across the street. Providence is an incredibly affordable city. Heck, you can buy a decent house with a mortgage that costs about $1000/month. I’m going to go ahead and assume that the costs cited on all the 2/3/4-bed places are actually cost per person, split among roommates? I honestly can’t possibly fathom those numbers being at all correct otherwise. There’s no way. I still don’t know if it makes sense to move, considering I’d still need to eat at least $62 + $314 a month on RIPTA + Commuter Rail passes and that definitely goes a long way towards dragging the monthly rent back towards what I’d pay to live in Boston, but I definitely need to revisit this. They weren’t per person. They were actual monthly rents for the entire apartment/house. Some of the listings in yesterday’s craigslist that I did not include were by person (or shares) and many others were much more expensive or in suburban areas. For the most part it should be assumed that utilities are not included (electric, heat, etc) unless they say otherwise. You wouldn’t need a car and would only need an MBTA commutation pass for the Smith Hill listing, since it’s only a 10- or 12-minute walk to Providence Station. Unless it’s crappy out or late and occasionally you wanted to take RIPTA to or from the station. On the other hand, if you looked Downcity, at a minimum you could expect to pay $1,200 for a 0-Bdrm, $1,500 for a 1-Bdrm, and $2,000 for a 2-Bdrm. I haven’t checked lately, but the East Side would likely be similar. Some of these sections may not be that pristine or a given block might be bad and would need to be checked out both at daytime and at night. You would have to find room mate(s). Look at the listings yourself. Some show interior photos. The only way to really know is to see places in person and talk to landlords or agents. Another way to find a place is to look at message boards like at Whole Foods, the Fertile Underground or at cafés where landlords or people looking for shares post listings. Craigslist also has shares listings. Actually, you can get places on the east side for relatively reasonable rents as well. It may not be Wayland Square, but you can get places in Fox Point or Mount Hope for reasonable rents. As Peter said, you need to look at places first, but generally speaking, you can get a decent place in a decent neighborhood that doesn’t require a car for $800-900 for a 2-3 bedroom (for the entire unit!). In most situations where people are paying only for a room, they’re paying $400-500. My rent of $950 for a 4 bedroom on Federal Hill is for the whole apartment. I pay $0 for transportation as I work Downcity and have a 12 minute walk to the office (I suppose one could argue the cost of my shoes and an umbrella are my transportation expenses).